I am pleased as punch to announce the birth of my first cousin on the Baron side of the family. 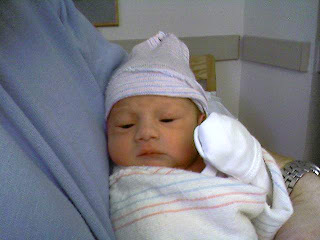 Andrew Smith was born Friday 2/1/08, coming in at 6 lbs 4 ounces and 19 inches long to aunt Dena and uncle Jim. Although he's my 8th cousin, he is the first one younger than me. I am excited to show him the ropes on all the cool stuff I've learned in 2 years. Isn't he a cutie?? ?